Oh, Ponds. The mid-season finale of Doctor Who gave the girl who waited and her Roman soldier a tearful (and at times terrifying) send-off. 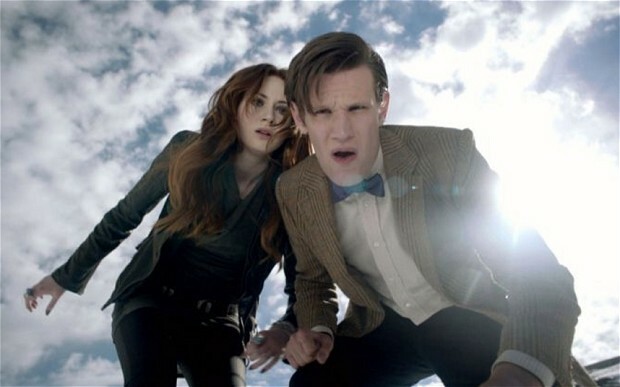 Almost before we could blink, Amy and Rory were gone forever, out of the Doctor’s reach – and out of ours. Rory accidentally stumbles upon the weeping angels (arguably the scariest monsters in Who history – if only because no one cares to remember the Silence) and gets zapped back to NYC in the 1930s. He gets swept up with River Song on her way to a notorious crime boss. River is supposed to help the crime boss solve the mystery of the invading angels while Rory (deemed unimportant as usual) is thrown to the “babies” – infant angels who give the toothy child monsters from Galaxy Quest a run for their money in the creepy department. The Doctor and Amy come to the rescue, TARDIS-style – crashing and bashing their way through the tricky timey-wimey traffic – but Rory has already been touched by an angel (not at all as funny as it sounds). The Doctor, Amy, and River meet up with Rory at Winter Quay, a spooky hotel full of the victims of the angels. Instead of just zapping people back in time to feed off of their time energy, the angels now contain their victims in one place, zapping them back in time again and again and again until their life runs out. In one of the rooms, the Doctor and company discover an old man on his death bed. The man calls out to Amy, and the group realizes – mere seconds before he passes away – that the old man is Rory. Our Rory and Amy, shocked by the apparently “fixed” nature of Rory’s demise, decide to create a paradox that will destroy the Winter Quay and stop the angels’ invasion. The Doctor thinks this means the couple will run try and run away. Rory and Amy decide this means committing suicide by jumping off the hotel. …before waking up, bright-eyed and without any broken bones, in a cemetery outside of the city. Apparently, the Doctor informs them, committing suicide did create a paradox that set everything back to normal. Hooray! As the gang prepares to pile back into the TARDIS, Rory notices something strange, a tombstone with his name on it. As he beckons Amy over, he suddenly disappears, leaving behind only a hideous angel with its arm outstretched. The Doctor begs Amy to come back to the TARDIS, pleading that if she lets the angel touch her he’ll never get to see her again. Amy has already made up her mind, though, from the moment she realized the angel had taken her husband. 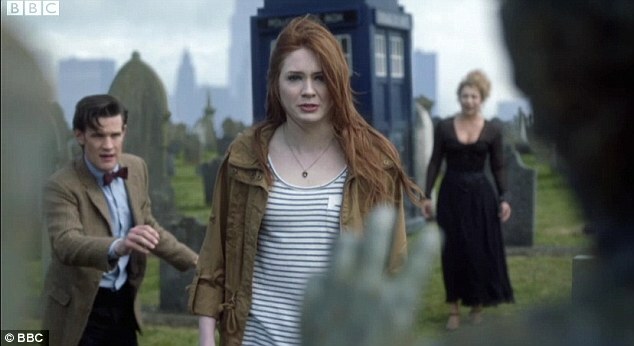 With a final “goodbye, raggedy man”, she turns, locks eyes with the Doctor, and disappears. 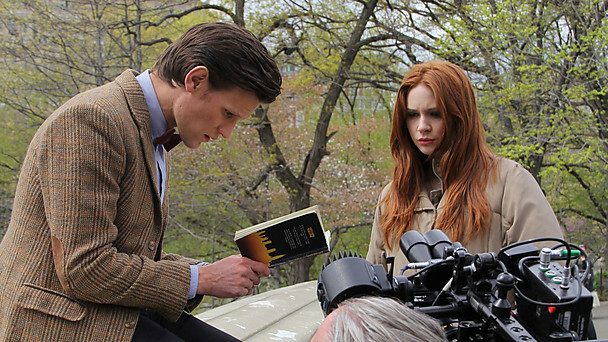 Devastated, the Doctor finds some solace in a letter from Amy. She urges him to never be alone and to remember how much she and Rory will always love him – however out of reach they may be in the fixed pocket of time the angel sent them to. She reminds him of the girl who waited for her “raggedy man”, the girl who would fall in love and fight pirates and save a space whale and give hope to the greatest painter of all time. And finally, painfully, she tells the Time Lord who hates endings that this, at last, is the end. I feel . . . sad. 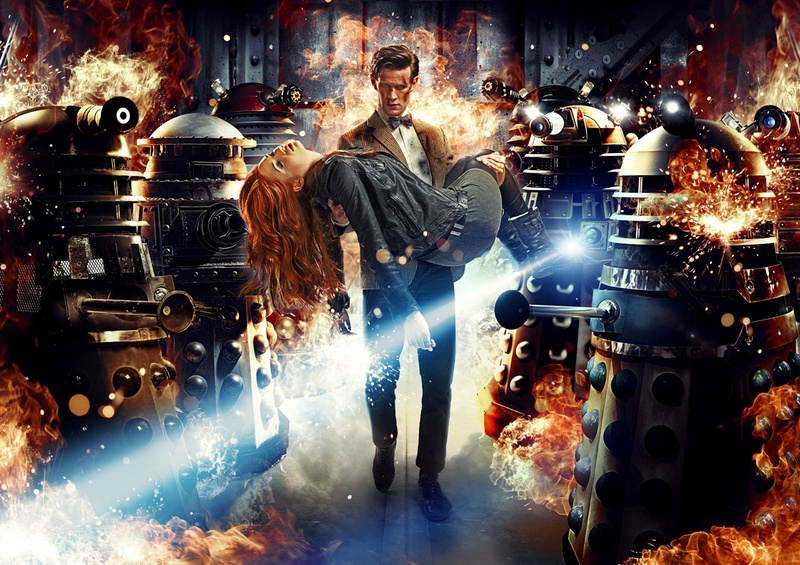 Though as a strong and unashamed advocate of seasons 1-4 of the rebooted series, I have to admit the emotional toll of this departure paled for me in comparison to Rose Tyler trapped in a parallel universe, Donna forgetting everything, and David Tennant dying (oh, you know what I mean). I think everyone has their “golden age” of Who and mine has obviously passed. 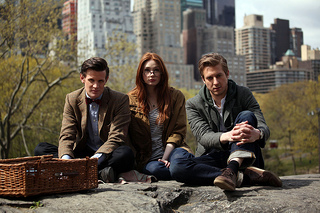 I still enjoy the show, clearly, but the departure of the Ponds doesn’t hit me quite as hard as I know it will for others. Plus, Amy and Rory are together and that makes the romantic in me happy. Why does Rory’s name appear on the tombstone before the angel touches him, but Amy’s name appears only after? How can River deliver a manuscript to Amy but not visit? If seeing old Rory die triggered young Rory to kill himself, how could any Rory ever be killed in the method the angels intended? What in the world is a “fixed event”, writers of Doctor Who? (I’ve had serious problems with this concept since the Pompeii episode — which incidentally featured Karen Gillan). And, perhaps most importantly, what will I have to look forward to watching every weekend now that Who is on hiatus? Well, Jenna Louise-Coleman is coming on board as the next companion. However, there are some messy problems with her character that were established in this season’s premiere. She’s a Dalek and dead, to put it bluntly, but we’ll get to see how Moffat and co. start to iron out those wrinkles in the Christmas special. Till then, Whovians, we can unite in our shared sadness over the passing of the Pond era. 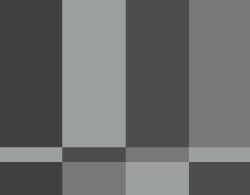 Grayle: What’s that? What’s happening? Is it an earthquake? What is this? River: Oh, you bad boy. You could burn New York. Grayle: What does that mean? River: It means, Mr. Grayle, just you wait ‘til my husband gets home. River: Turns out the person I killed never existed in the first place. Apparently, there’s no record of him. It’s almost as if someone’s gone around deleting himself from every database in the universe. The Doctor: You said I got too big. River: And now no one’s ever heard of you. Didn’t you used to be somebody? The Doctor: Weren’t you the woman who killed the Doctor? The Doctor: I’m sorry, Rory . . . but you just died. Amy: You think you’ll just come back to life? Amy: Well then, I just have to blink, right? The Doctor: You are creating fixed time! I will never be able to see you again! The Doctor: Amy, please! Just come back into the TARDIS. Come along, Pond. Please . . .
Amy: Tell her this is the story of Amelia Pond . . . and this is how it ends. Geronimo, Whovians! Season 7 of the rebooted British television show is here and ready to amuse, amaze, astonish, and confuse! The Doctor, Amy, and Rory are all kidnapped and taken to the Dalek parliament – a lot like a human parliament, except that things seem to actually get done. The dynamic trio is forcibly sent to the asylum of the Daleks, a hellish planet full of all the Daleks the regular Daleks thought were too demented and weird. The regular Daleks want the Doctor and his companions to lower the force field on the asylum so that the whole thing can be destroyed. The Doctor, Amy, and Rory are aided by a quirky young woman named Oswin who escaped the fate of the rest of her crew by hiding out. She speaks to the three by hacking into the communication systems and helps the Doctor move around by erasing the memory of him from the Daleks’ hive brains. Amy and Rory realize they still love each other. Amy kicked Rory out because she knew he wanted kids and she couldn’t have any. Poor girl who waited; poor boy who waited 2,000 years. The Doctor finds a convenient teleport. 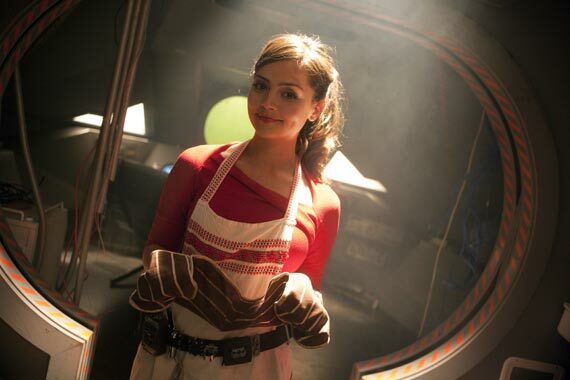 He plans to lower the force field (thus completing their Dalek objective), rescue Oswin from her fortified hiding place, and escape the asylum before the Daleks’ take this opportunity to kill him and his friends. The Doctor’s plan hits a major road block when he arrives to save Oswin. Why? Because plot twist – she’s a Dalek!!! She used to be a human, but upon crashing on the planets, the Daleks recognized her intelligence and decided to surgically transform her into one of them. Oswin didn’t even realize she was a Dalek. Oswin tearfully fights back her Dalek urge to kill the Doctor and tells him to remember her as he leaves. The Daleks have a new trick up their . . . plungers. It’s about time, too. Up till now, viewers have had to nod skeptically as the Doctor insisted his worst enemy was a herd of discarded kitchen appliances shaped like upside down ice cream cones (and, come on, it’s not like season 5’s primary color paint job helped that dynamic). Anyway, the Daleks can now infiltrate human bodies, living or dead. Why is this important? Now Daleks can be anywhere. Before you could spot one a mile away and deflect an attack with a baking sheet. Okay, I’ll indulge myself a bit and ramble on about a problem that probably bothers only about 0.05% of Doctor Who fans. The Daleks are life forms, unpleasant or not. Why does the Doctor’s mantra of compassion not extend to them? No, I get it – the Daleks love killing and hating. They would never understand compassion. But at least past seasons, noticeably Eccleston’s only season and Tennent’s third, addressed the discrepancy between how the Doctor views killing and how the Doctor views killing Daleks. I get that perhaps there’s not as much room for this dark and morally-ambiguous type of story-telling (also highly evident in Tennent’s “Waters of Mars”) in the new seasons, but I still miss it. Get ready, nerds – this one’s a doozy. Last March, producers announced that British actress Jenna-Louise Coleman would be the Doctor’s next companion. Show runner Stephen Moffat was pretty adamant in insisting that her first appearance would be in this year’s Christmas special. The problem? Coleman surprised everyone by showing up as Oswin in the premiere episode. This, of course, wouldn’t be a massive problem except for the fact that Oswin is a) a Dalek and b) dead. I almost wrote an essay about the different ways out of the Oswin problem, but that’s probably not helpful to anyone. Suffice it to say, I trust Moffat. He has a near-perfect record when it comes to innovation, shock, and trippy timey-wimey shenanigans. Sure, he’s barely hovering at 50/50 concerning logical season arcs, but nobody’s perfect and I’m a tough season arc critic (which is probably my only real, unique skill – and it’s not even that real). The Doctor: What so special about this lot then? Oswin: Don’t know. Survivors of particular wars. Spiridon. Kembel. Aridius. Vulcan. Exxilon. Ringing any bells? Rory: Oh, so this is the kind of escape plan where you survive about four seconds longer. The Doctor: Well, it’s me. You know me. The Doctor. The Oncoming Storm. The Predator. Dalek: Titles are not meaningful in this context. Doctor who? The Doctor: Oh, Oswin. Oh, you did it to them all. You, beauty. Daleks: Doctor who? Doctor who? The Doctor: Fellas, you’re never gonna stop asking.